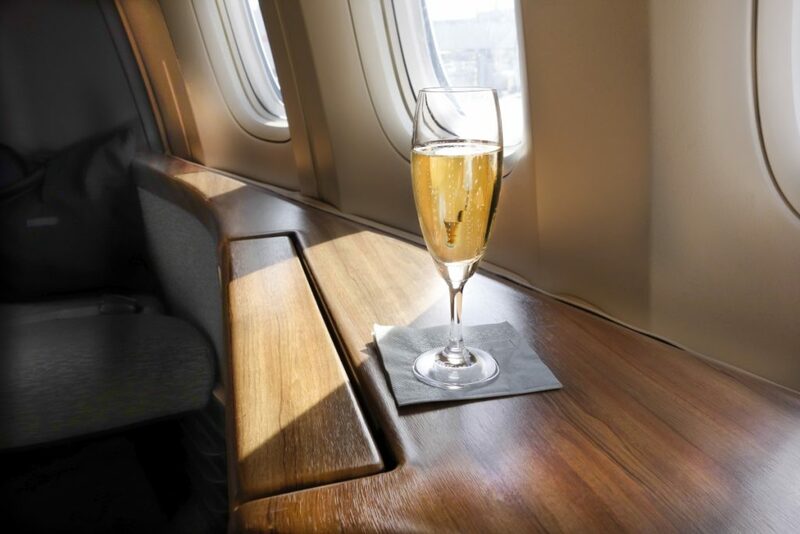 Home » Blog » How much champagne is consumed on business class flights? How much champagne is consumed on business class flights? As many of you may agree, a long-haul flight can be a rare opportunity to sit back, relax and enjoy a well-earned break. For those who have been lucky enough to travel premium economy, business or first class in the past 12 months, this also includes indulging in a couple of glasses of champagne. In fact, based on a SkyClub customer survey, it’s been estimated* that a gigantic 7.8m bottles (39 million glasses) of bubbly are enjoyed on these luxury flights to and from the UK each year. “You are now in the lounge, would you like a glass of champagne?” Of these respondents 69% said yes. To those 69%, SkyClub then asked the following question, on a sliding scale from one to ten, “on average, how many glasses of bubbles do you consume on a luxury flight?” From those replies, we uncovered that a mean average of 2.44 glasses were sipped by these travellers. Given that each glass of champagne contains around one million bubbles, this arguably makes long-haul flying a truly effervescent experience. So how much champagne is that? If you placed them end-to-end, 7.8 million, 12.5-inch-long champagne bottles would take you on a journey of 2,500 km (1,554 miles) – the distance from London to Moscow. 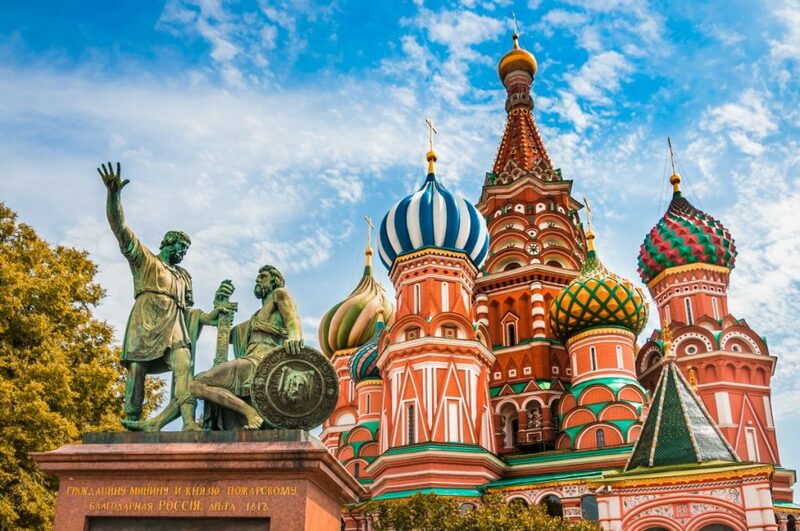 On your trek to Moscow, if you pass through Scotland, then let the Proclaimers know that you are walking 500 miles more than they would to fall down at your door. 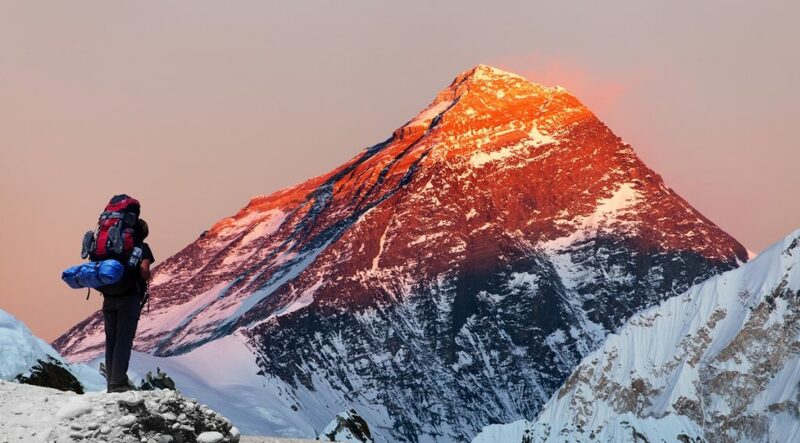 Stacked up on top of one another, 7.8 million, 12.5 inch-high champagne bottles would create 291 Mount Everest-sized (8.85 km) towers. The average volume for a glass of champagne is 150ml/0.15L. So 39m glasses x 0.15L = 5.85 million litres of bubbly, which is enough to fill to 2.5 Olympic-sized swimming pools. If you left a bottle of champagne to go flat, it would release an estimated five litres of gas. Conveniently, in a standard party balloon there are approximately five litres of gas. 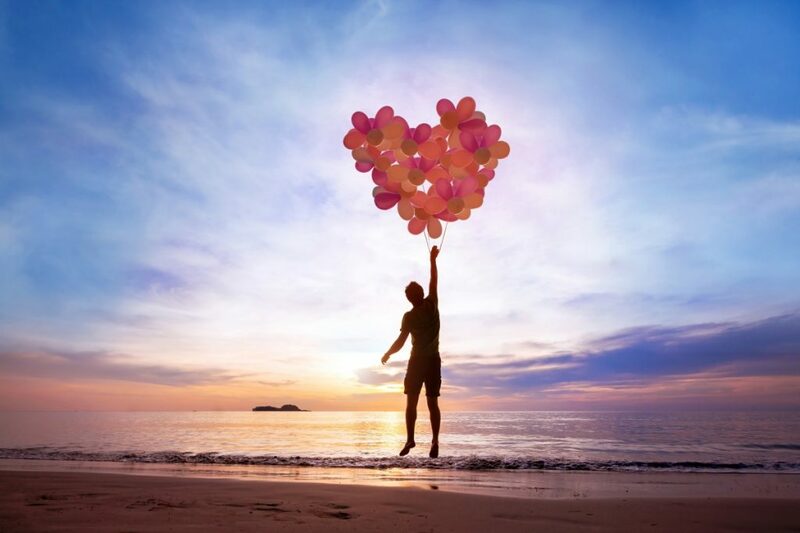 It takes 4,000 party balloons to lift an average human. Therefore, if the champagne gas was helium then 7.8 m bottles of champagne would be enough to lift 1,950 adults into the air. From balloons to bubbles. There are one million bubbles in a champagne glass and so, given the estimated 39m glasses of champers that are sipped on long-haul flights each year, that’s 39 trillion bubbles…which is approximately how many cells there are in the human body. If you would prefer a more dramatic lift into the air, the combined force of 7.8m champagne corks popping would, according to SkyClub’s physicist friend Zak, be 1.5 giga newtons – a force that’s equivalent to 300 Saturn V engines blasting off into space. After busily exploring a city, scaling the world’s highest mountain, swimming two Olympic-sized swimming pools, floating and blasting off into the sky, a bit of rest and recuperation is deserved. 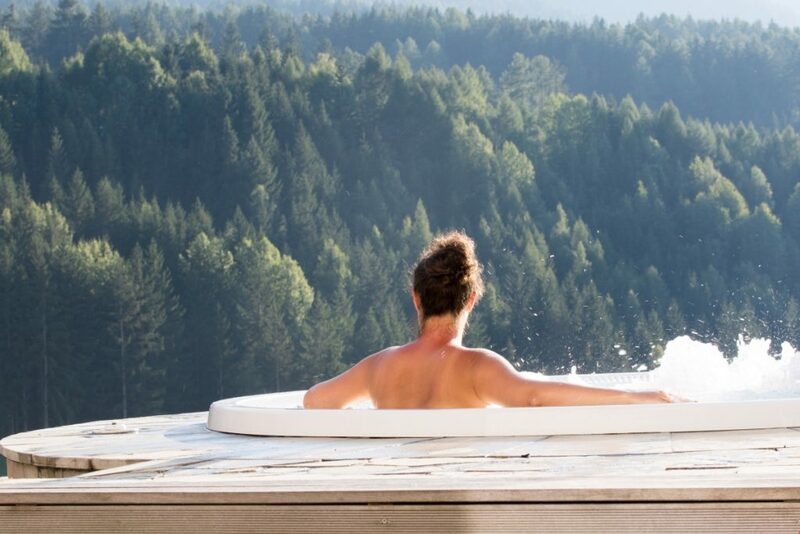 Which is just as well as 7.8 million bottles of champagne is enough to fill up 4,875 six-person, standard-sized Jacuzzis, each with a volume of 1,200 litres. 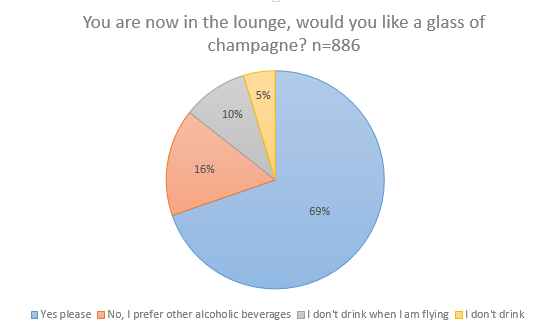 • According to the n=886 respondents to the champagne question in SkyClub’s survey, 69% of premium economy, business and first class passengers will say yes to champagne in the lounge and/or on the flight. • The average amount of champagne consumed per journey is 2.44 glasses. And so, 2.44 glasses x 16m qualifying passengers equates to 39m glasses of champagne consumed. Furthermore, as there are five glasses of champagne in every bottle this adds up to 7.8m of this fine fizz being consumed on long-haul flights each year. Note – whilst we spent a long-time calculating these numbers, this analysis is just a bit of fun and at the top end of what might be consumed. We have not taken into consideration Middle Eastern flights, shorter distance early morning departures and customers who might be answering based on their last flight, which might have been for a special occasion or if the time was right. It also assumes that a full standard glass of champagne is being served. Baby boomers also made up 43.6% of the respondents and arguably like a drink more than any other demographic! To close, it seems appropriate to present the data for the mean average of 2.44 glasses consumed in an, ahem, bar chart. SkyClub is the number one supplier of discounted first and business class flights out of the UK. If you fancy some bubbles on your next flight, simply fill out the form on this page and we will save you money faster than a champagne cork goes pop! Make an enquiry.